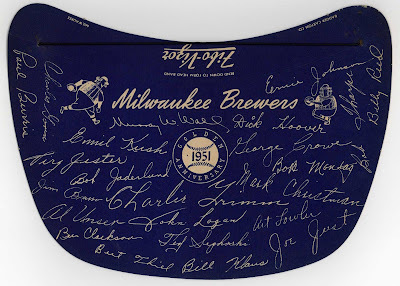 This cardboard souvenir visor dates to 1951, as the American Association and the Brewers were both celebrating their golden anniversaries. 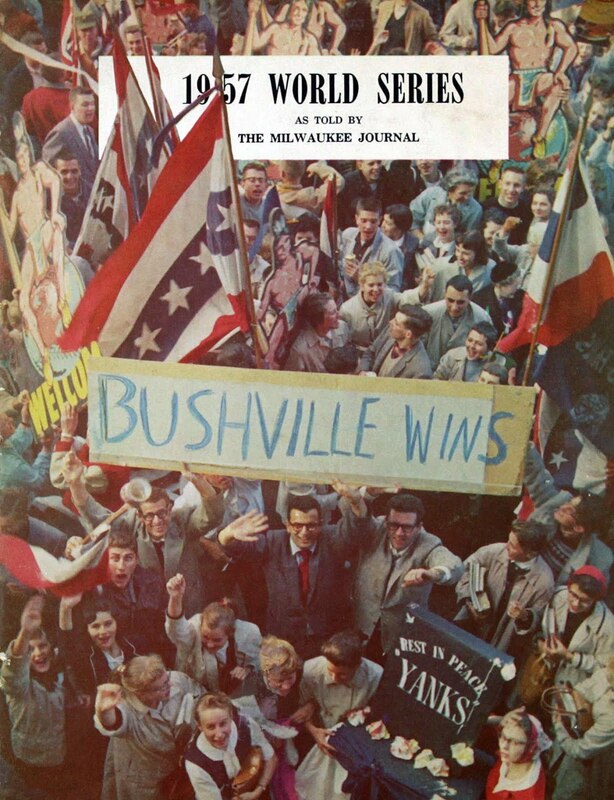 The graphics are fun; the American Association's Golden Anniversary logo, Owgusts pitching and catching (taken from the masthead of Brewer News, the team's newsletter) and facsimile autographs. 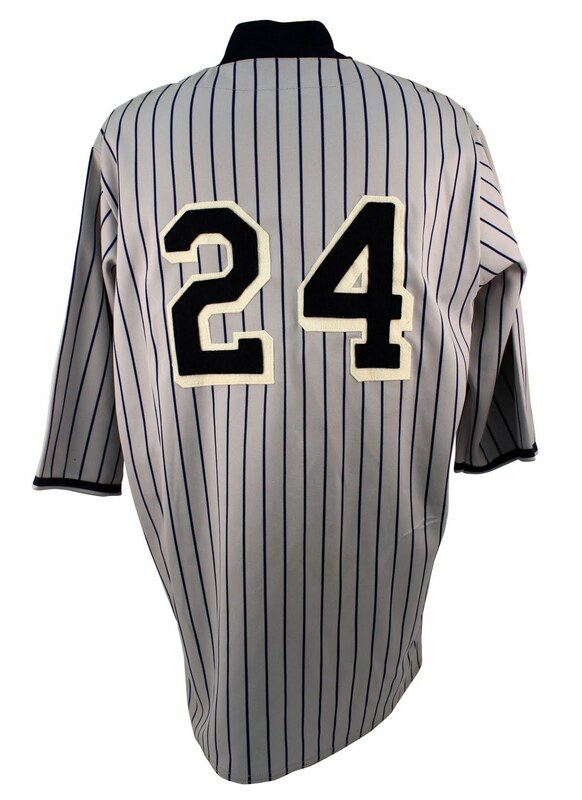 A lot of facsimile autographs. There are many notable names on this list. 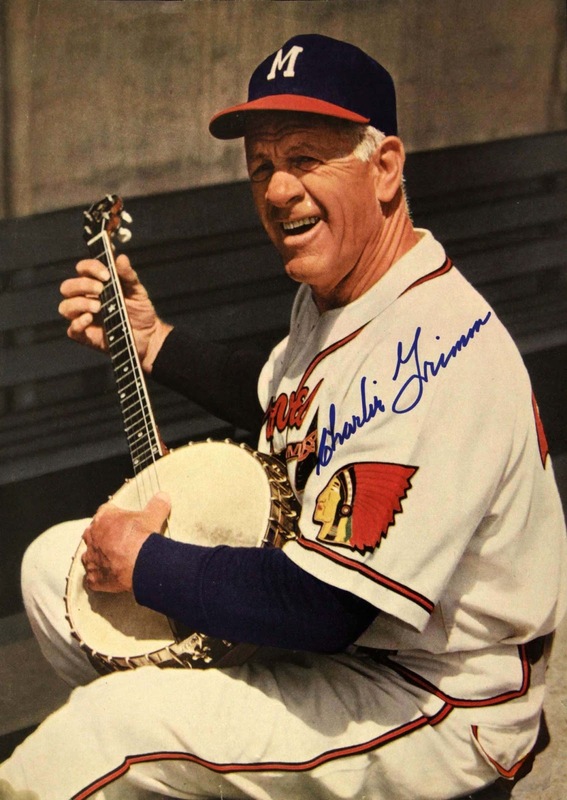 Charlie Grimm was, of course, a towering figure in Milwaukee baseball history. 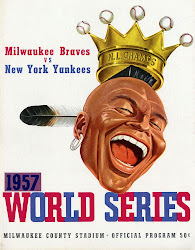 In 1951 Jolly Cholly was in his second stint as Milwaukee skipper, and would be promoted to lead the Boston Braves partway through the following season. 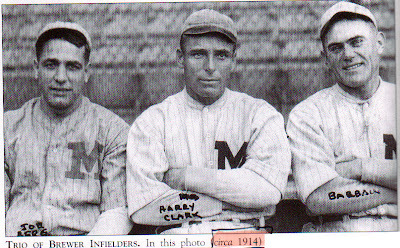 Buzz Clarkson and George Crowe, respectively, were the second and third African-American players to wear Brewer uniforms. 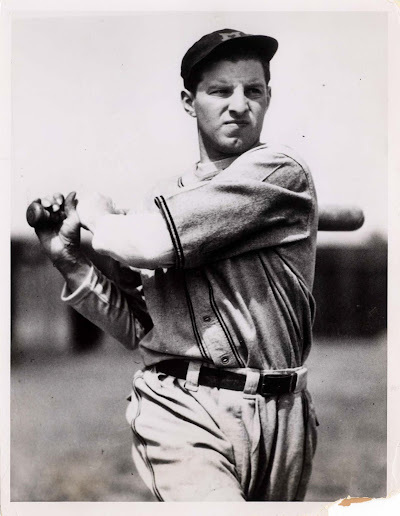 The first, Leonard Pearson, had come to the club in July of 1950 but was sent down to the Braves' farm club in Hartford, Connecticut on May 1st of '51. 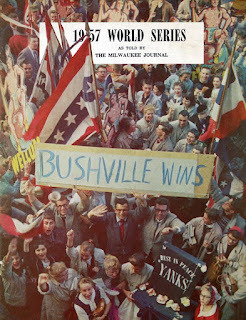 Clarkson had a brief callup with the Braves in early 1952 but returned to the Brewers in time to play the bulk of the team's final season in Milwaukee. Crowe had the best career of the three, earning the American Association's Rookie of the Year in 1951. 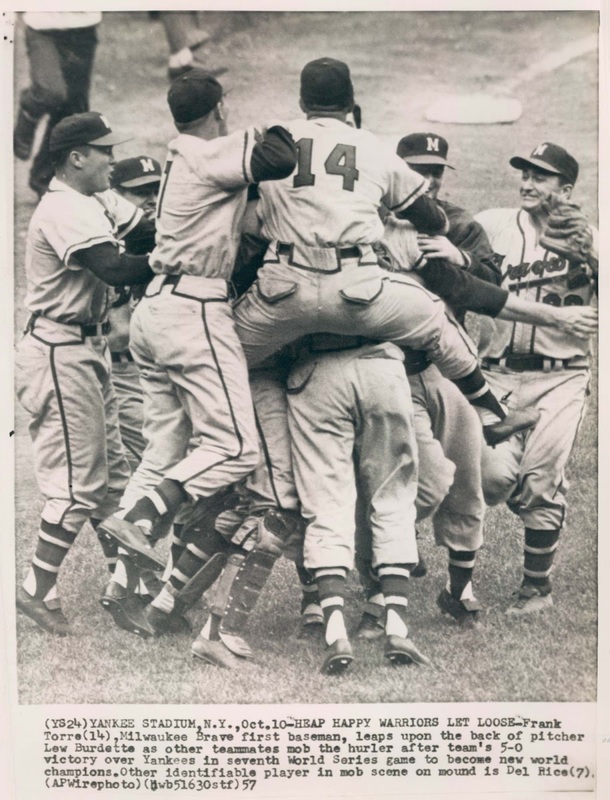 He went up to the Boston Braves in 1952 and came back to Milwaukee as a major-leaguer with the rest of the club in 1953. 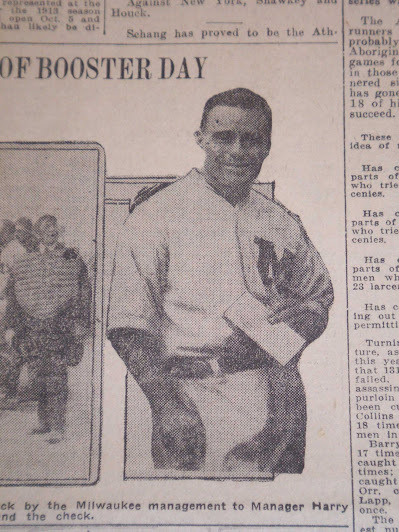 Johnny Logan, who later became a household name with those same Milwaukee Braves, also has his autograph here. 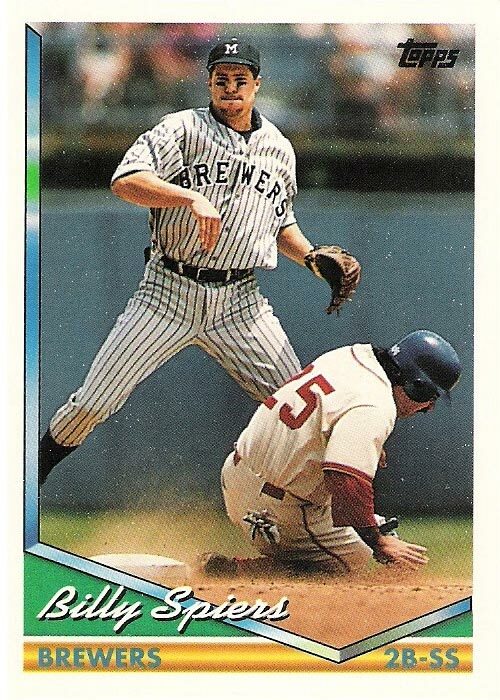 He was considered an important prospect as he began his fourth season with the Brewers, and the scrappy shortstop was called up to Boston on July 5. The presence of outfielder Ted Sepkowski can help us date the visor. His contract was purchased from the Chicago Cubs and he came from their farm team in Springfield, Massachusetts on May 28. 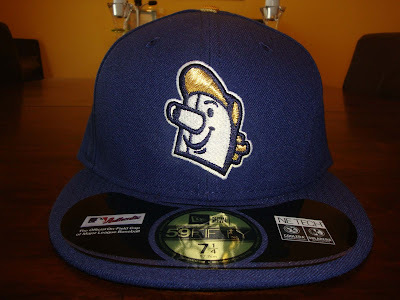 According to baseball-reference.com, Sepkowski only played in seven games for the Brews before being sent to the Braves' Southern Association club in Atlanta on June 23rd. 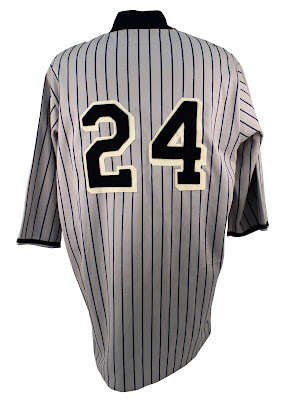 One name from the 1951 roster is notable for its absence. 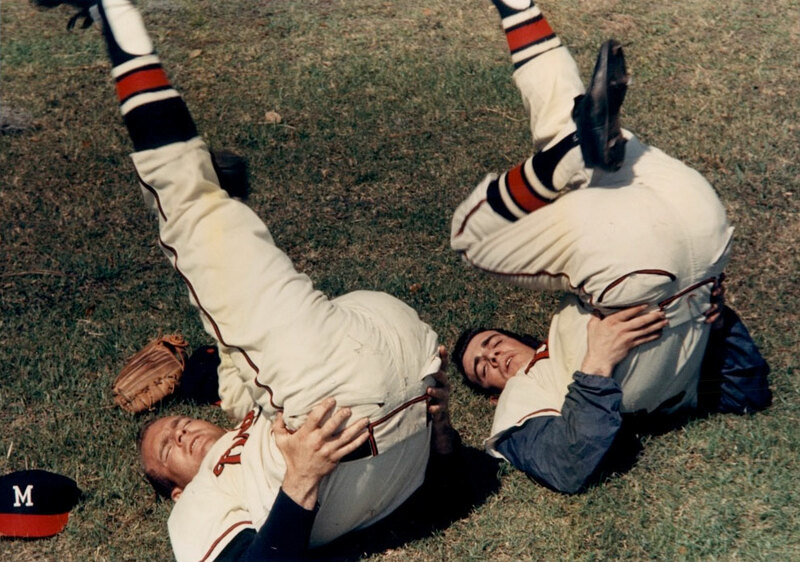 Third baseman Eddie Mathews played part of the season in Milwaukee after securing his discharge from the Navy on July 8. The popular third baseman saw action in a Brewer uniform for only 12 games before being optioned in early August, also to the Atlanta Crackers. Mathews, who had played for the Crackers before entering the service, was sent south by the Braves largely to boost that club's sluggish ticket sales, another brief stop on his way to the majors. 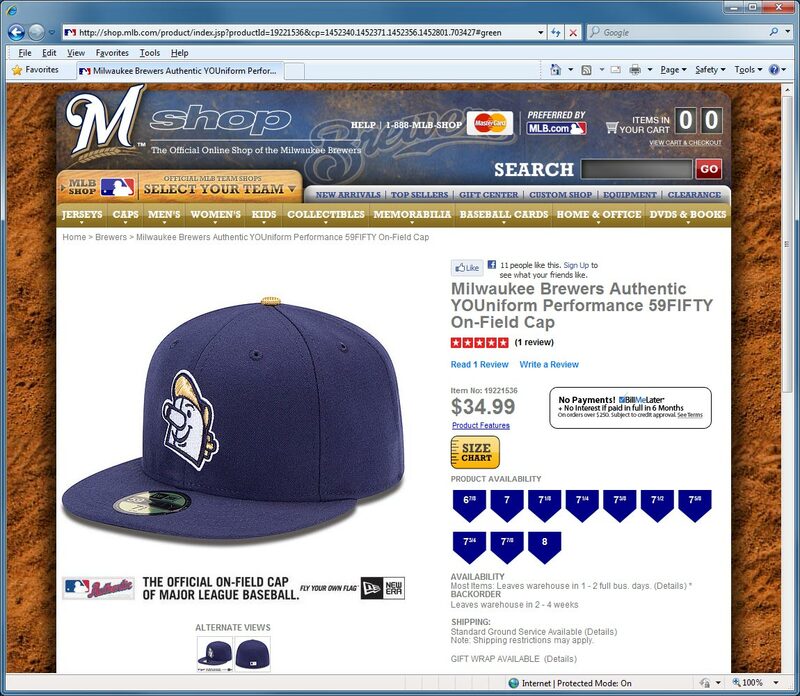 The visor itself, labeled "Fibo-Vizor", was made by the Badger Carton Company of Milwaukee. 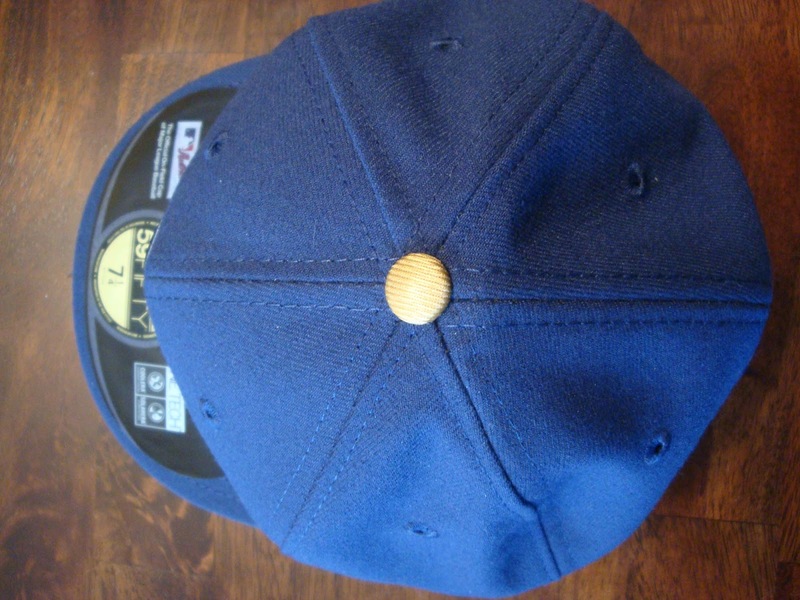 It's a fairly simple but ingenious design; the scored tab curves when folded over, and an elastic band holds it in place. 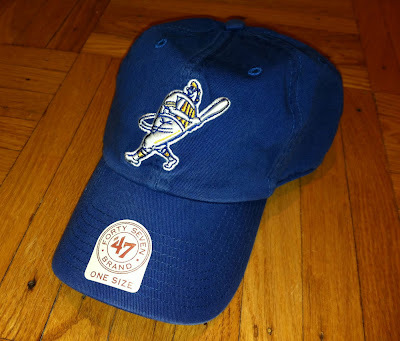 I don't know if this item was given out to fans, or sold at the concession stands, but it remains a unique artifact of Milwaukee's baseball history. 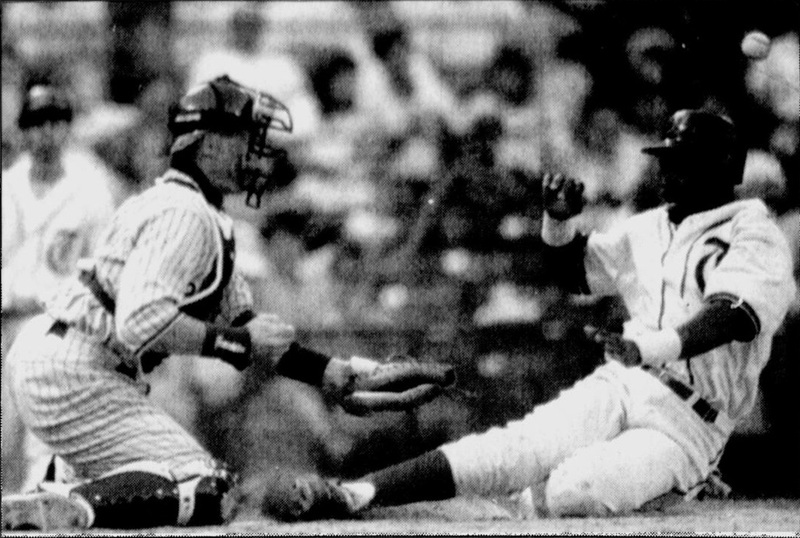 Dressed in old-style uniforms, Texas' Julio Franco slides home safely as Milwaukee's Dave Nilsson waits for the throw in Milwaukee. As ubiquitous as Turn Back the Clock events have become, it's hard to remember a time when they weren't a fixture in the baseball season. 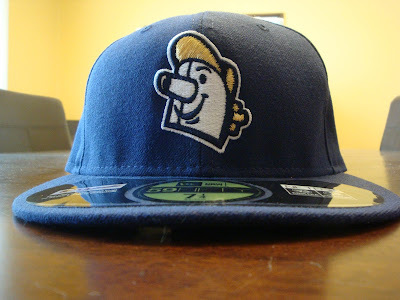 The Brewers have held throwback games honoring the 1970 Brewers (twice), the 1975 Brewers, the 1978 Brewers, the 1989 Brewers, generic "1970s", "1980s" and "1990s" Brewer teams, the 1957 Milwaukee Braves (three times), the 1958 Milwaukee Braves, the 1923 Milwaukee Bears (annually since 2006), the 1969 Seattle Pilots and the 1982 Brewers (more times than I can count). 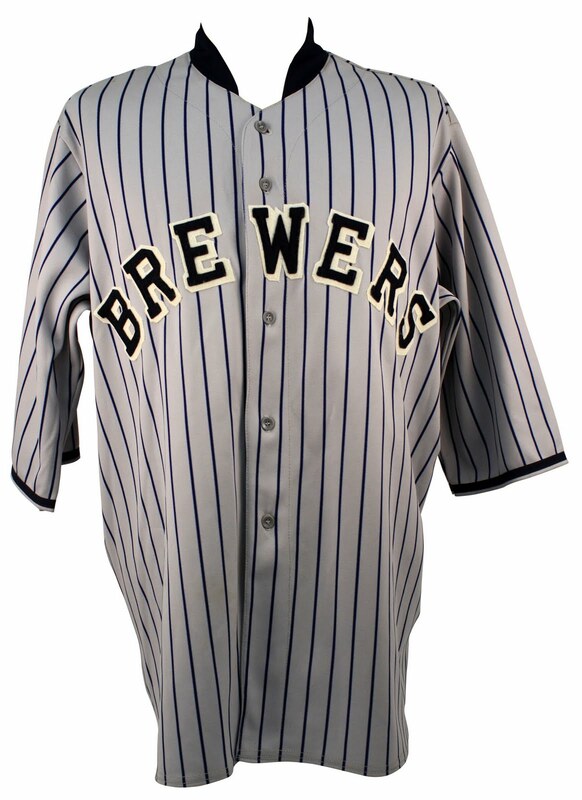 They've also had throwback games in which they wore American Association Brewer uniforms. 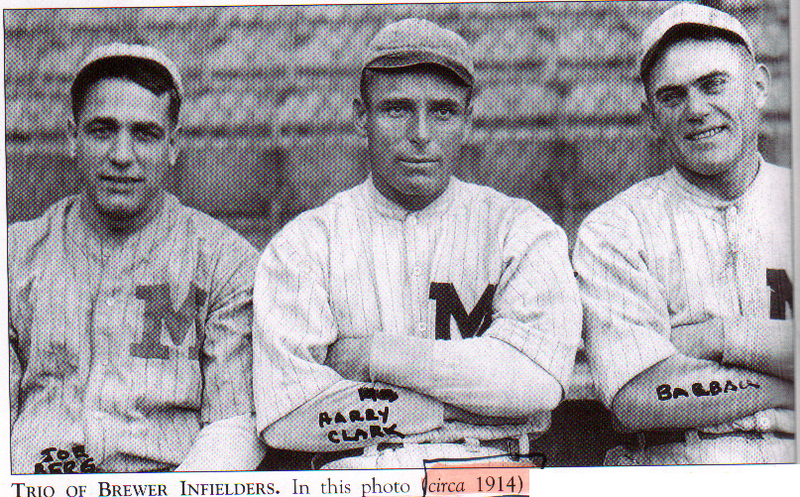 Three times, in fact, although the first two were part of a single set. 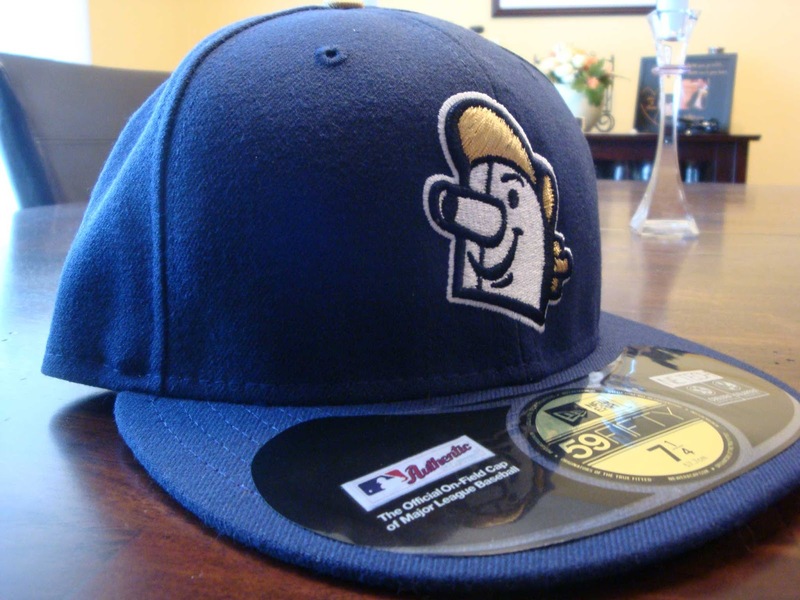 The team's association with Turning Back the Clock starts slightly early than that, twenty-three years ago, when the notion of one team dressing up like another was novel, the American League Brewers own the distinction of having taking part in the very first TBTC game. 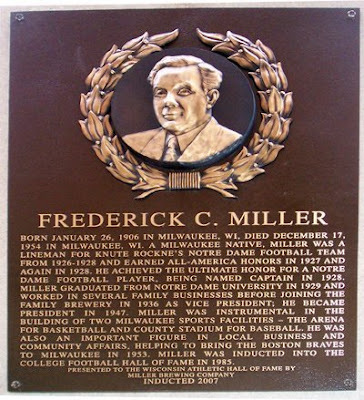 It was July 11, 1990, on the South Side of Chicago. The White Sox, no strangers to innovation, had come up with an entirely new kind of promotional gimmick. 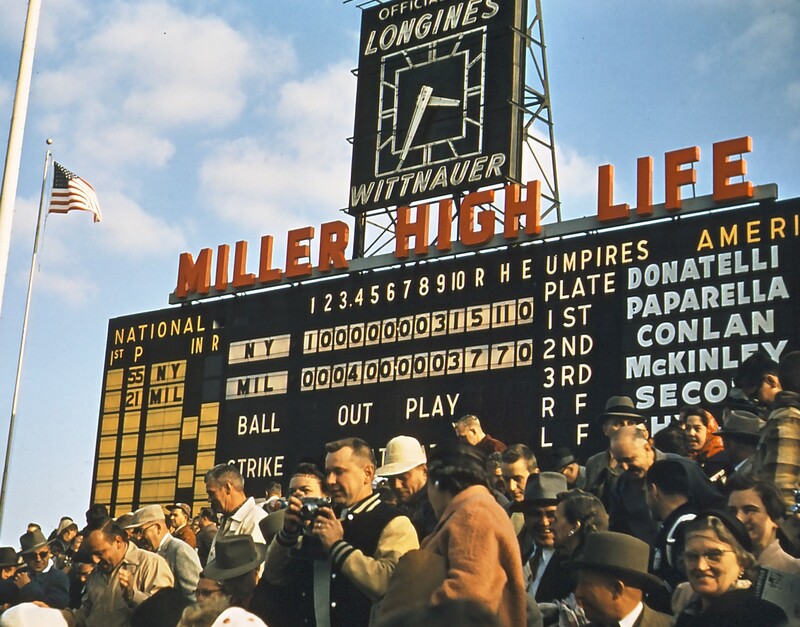 They turned off Comiskey Park's electronic scoreboards, announced lineups through a large megaphone, and hired a barbershop quartet to prowl the grandstand. 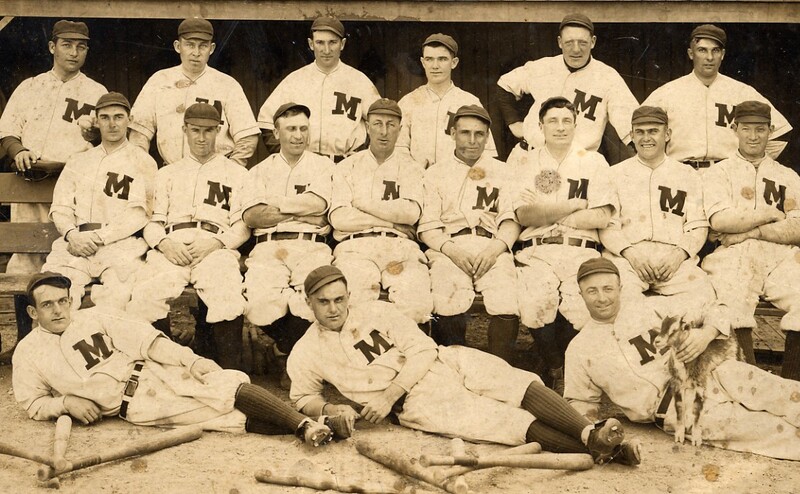 The players themselves gussied themselves up in their 1917 finest, with short-brimmed baseball caps and baggy pinstriped uniforms. 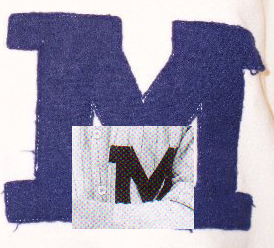 Their opponents that day, however, were firmly planted in the 1990s. 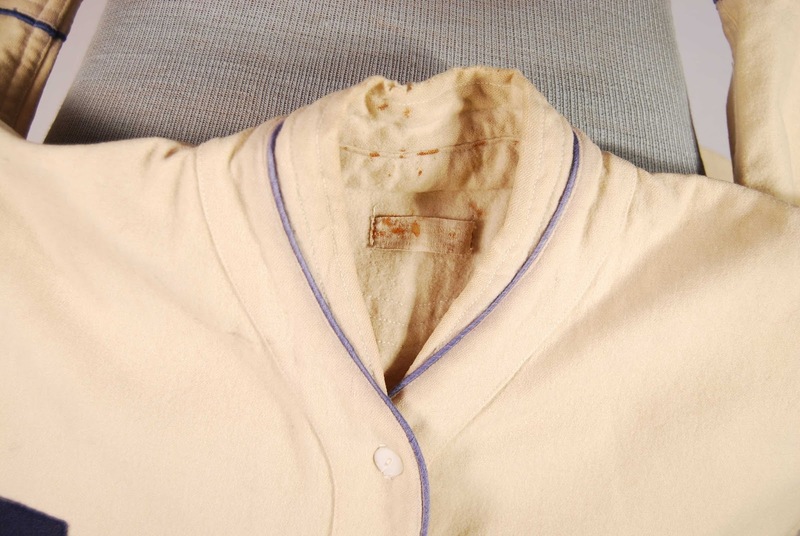 The Chicago team's quest for period authenticity apparently didn't extend to buying uniforms for the visiting club, so the Brewers wore their regular road grays trimmed in royal and gold while beating the South Siders 12-9. 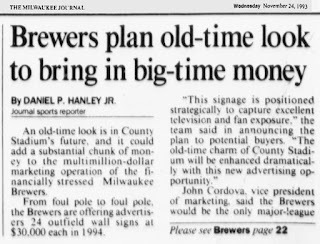 It wasn't long before other teams, including the Brewers, decided they wanted in on the fun. 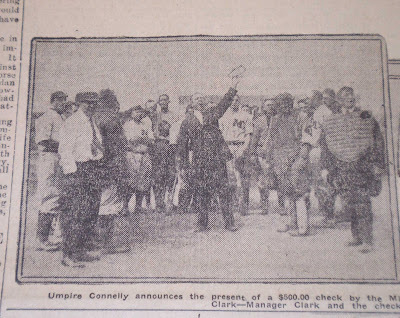 Or perhaps it was seeing the Sox draw 40,000 fans to a mid-week game that would have normally seen less than 10,000. 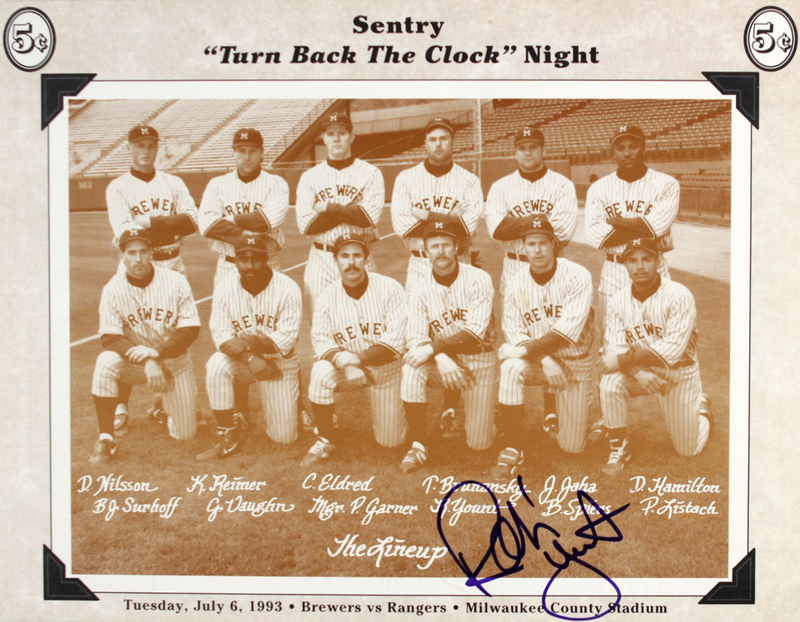 Whatever the motivation, the Brew Crew scheduled a pair of Turn Back the Clock games for the 1993 season, in the form of a home-and-home series with the Texas Rangers. 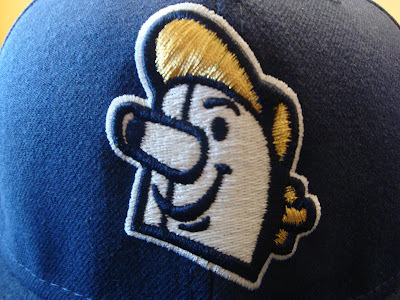 And for these games, they decided to honor their namesake, the Brewers of the American Association. 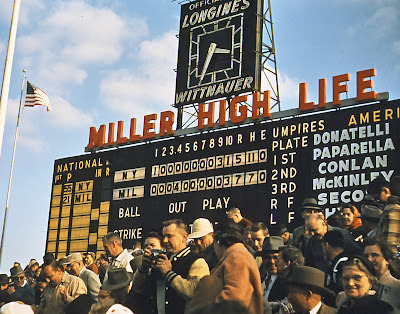 The first game of the series was in Arlington Stadium on May 1st. 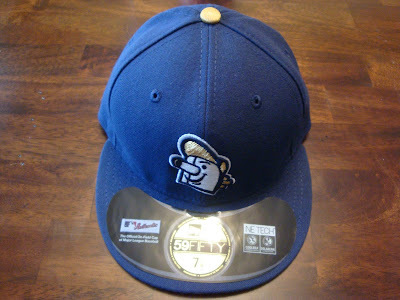 The Brewers emerged victorious, 4-3 in ten innings. 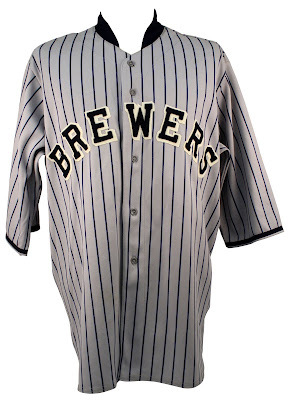 The Brewers wore the same uniforms for both games: gray with black pinstripes, black block letters and numbers accented with a white outline and drop-shadow. 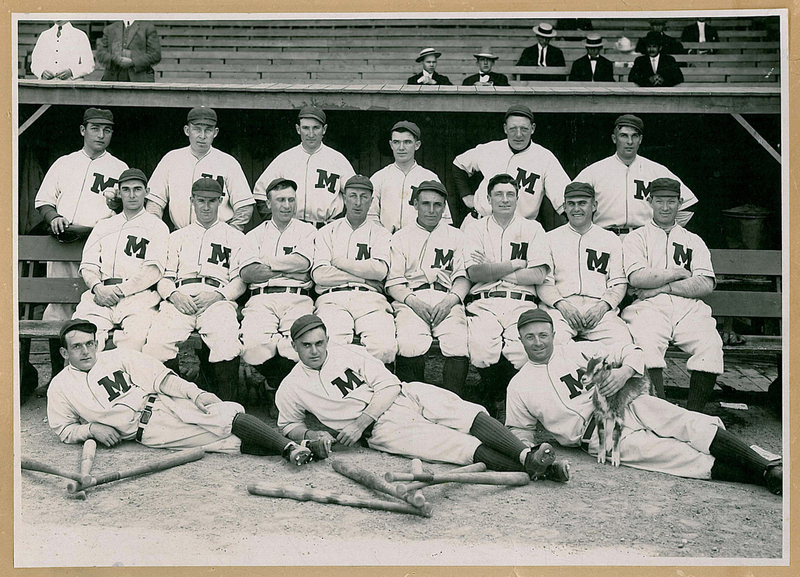 The uniforms were sharp-looking but of dubious historical accuracy. I think these uniforms were intended to be reminiscent of the Brewers' brief 1920s foray into pinstipes, the distinctive uniform feature which had worn by the big league club for fifteen years at this time. Pinstipes were never really identified with the Brews, representing only a minor digression in the team's half-century æthetic history, but I do like the longer sleeves and cadet collar. 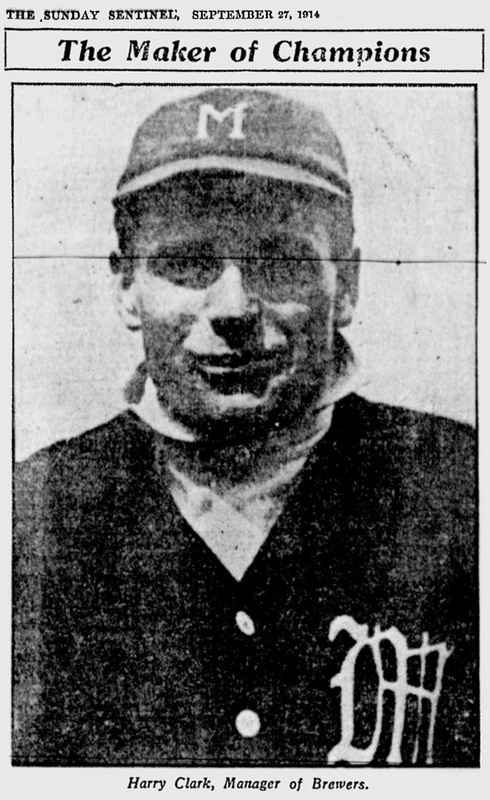 The short-billed caps, with their white block "M", could easily have come right off the head of a player in the early days (as seen here on manager Harry Clark in 1914), but the jersey is more a fanciful projection than a reasonable replica of anything the Brews actually wore. 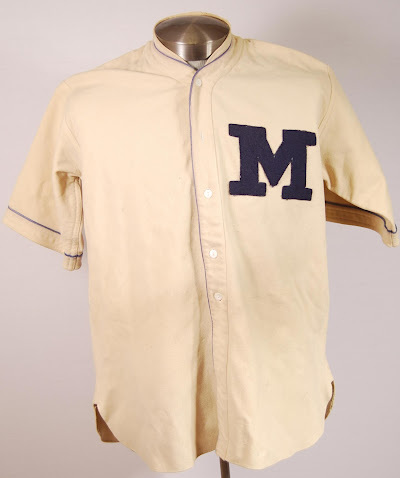 In particular, the club never used the "Brewers" nickname on its jerseys until Bill Veeck added it in 1942, preferring to wear an "M" at home and matching "M" or the name "Milwaukee" on the roads. And while black was indeed a Brewer color in the first decade of the 20th century, the Brewers had adopted blue by 1913 and continued to wear it through the team's final season in 1952. 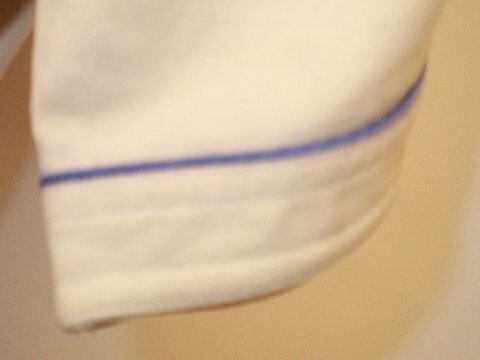 I'm not aware of either the caps or jerseys being produced for retail, a consideration which would eventually become a driving force in these events. 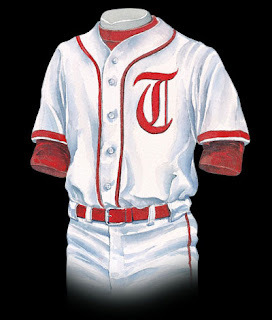 The Rangers also created an old-timey-style uniform for the two games, inspired by the æsthetic of the 1920s if no one Texas-based team in particular. It consisted of simple white jerseys trimmed in red piping and garnished with an red Old English "T" on the chest. The second game of this unique series was held at Milwaukee County Stadium on July 6, 1993, likely the only time in Milwaukee County Stadium's history where the home team wore gray and the visitors white. 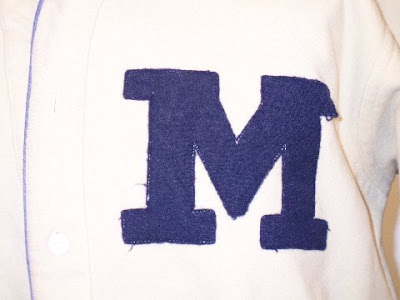 The theme of the day was "1920s" everywhere you looked. General Admission seats were $3, bleachers were $2, and hot dogs, popcorn, peanuts and soda were all $1 each. The club also hired a big band and a barbershop quartet to entertain the fans. 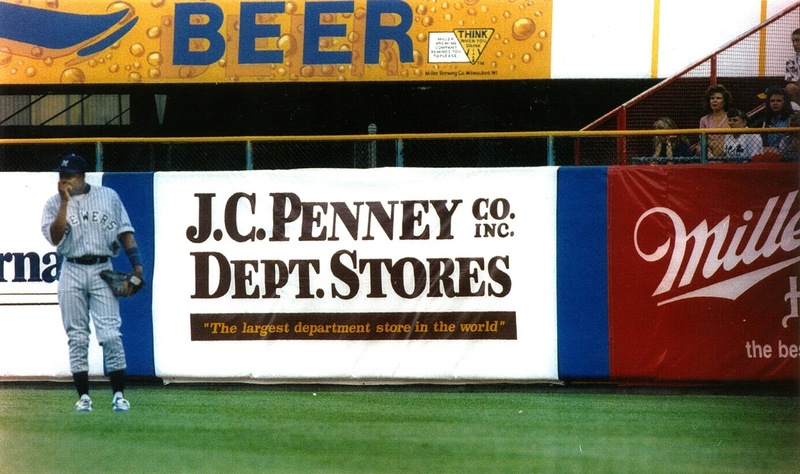 To complete the old-timey feel, the Brewers lined County Stadium's outfield wall with advertisements. 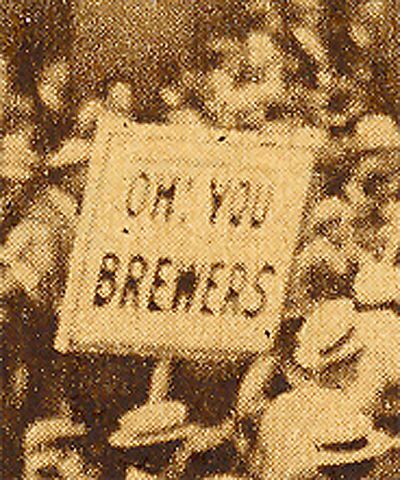 All the old-style trappings couldn't help the Brewers, who were embarrassed that day, losing 11-1. Julio Franco (left) scores as Brewers catcher Dave Nilsson fumbles for the ball in the second inning Tuesday. 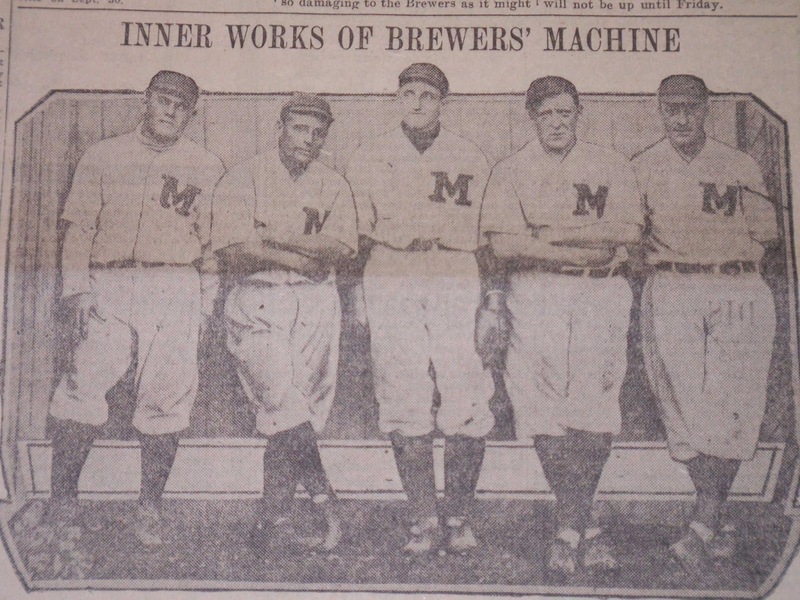 Columnist Michael Bauman of the Milwaukee Journal called it "an enjoyable promotional concept that unfortunately had to be followed by the Brewers playing another bad game." 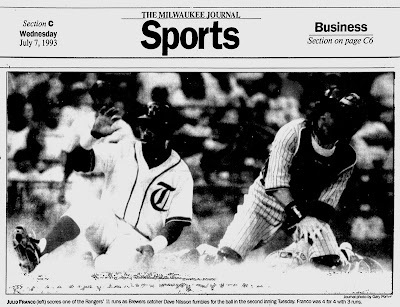 The promotional concept did its job, drawing a pretty good mid-week crowd of 26,854, but the 1993 Brewers just couldn't deliver on the field. 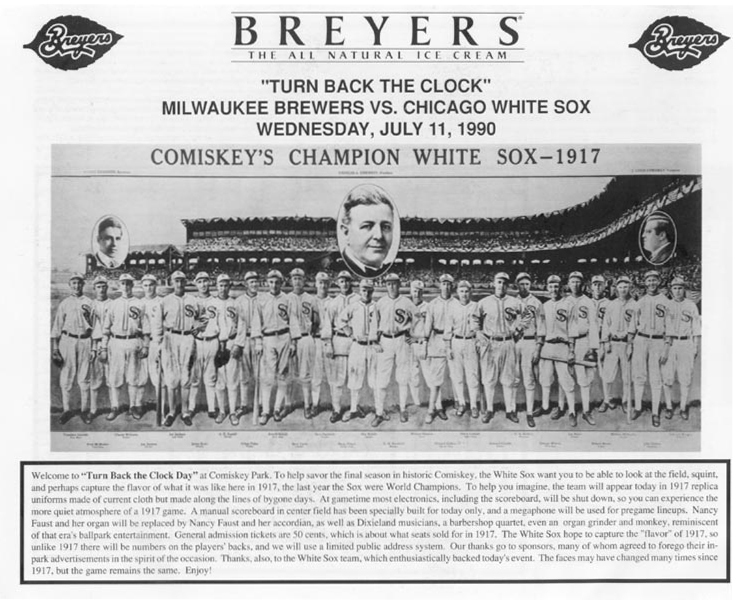 Aside from sparking fan interest and setting the stage for an untold number of Turn Back the Clock events in Milwaukee, there was one other lasting impact from that game in July. 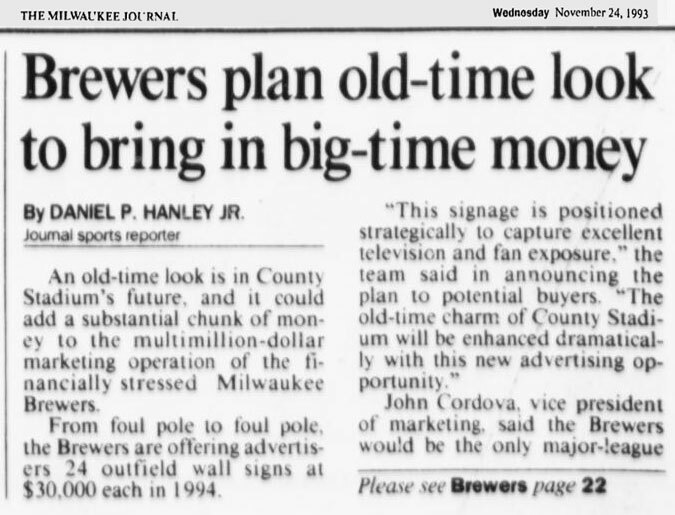 In the following off-season, the struggling Brewers announced that they would start selling permanent ad space on the County Stadium outfield wall. 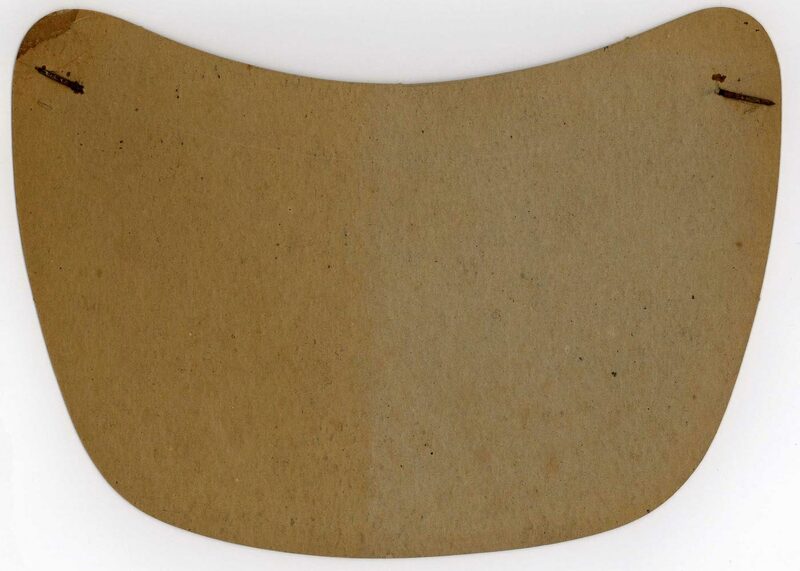 "On turn-back-the-clock day, we asked people how they felt about it and how it looked. 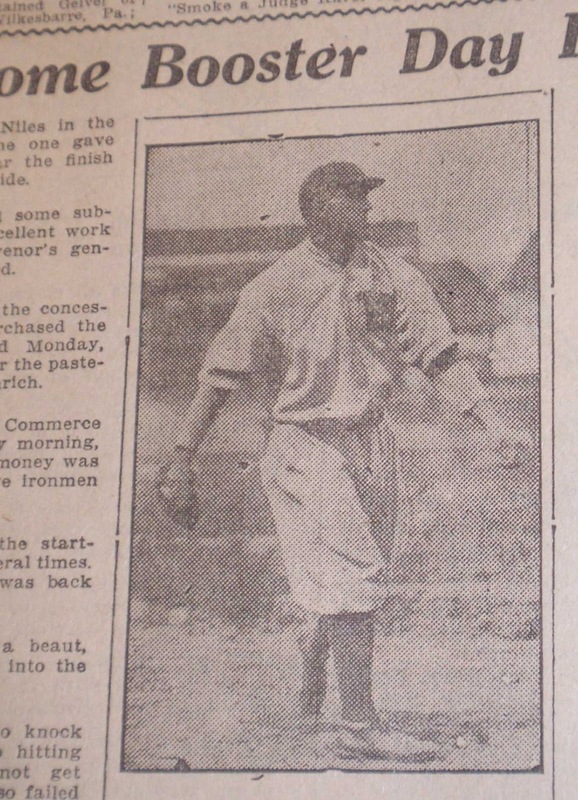 It was positive on both accounts. "There was fence signing practically across the board in a different era. We believe this ballpark is a throwback stadium and the look will be appropriate. It's an additional revenue stream for us and enhances the look of the ballpark." "One thing that was missing in Texas was the outfield wall signs. We debated [about having them here] over the course of the summer and said 'Why not?' 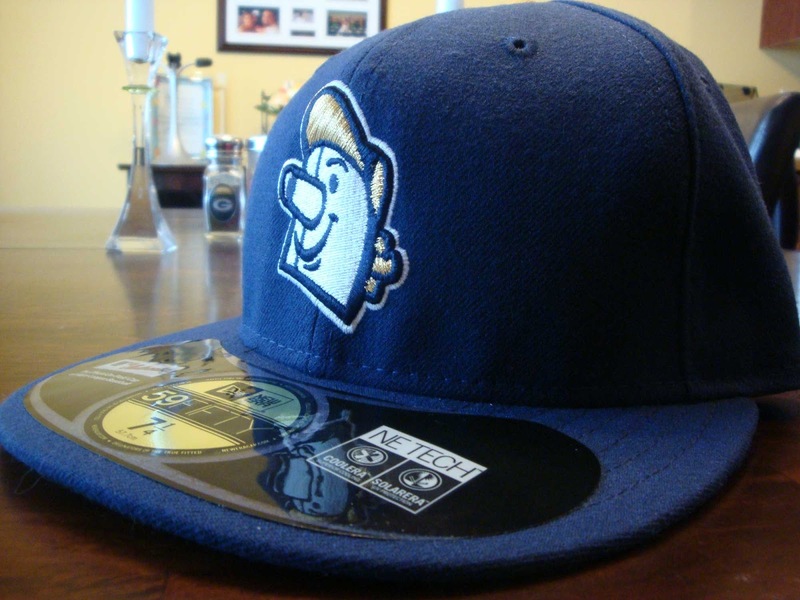 It's not going to make us look minor league. The interest from advertisers had been strong. 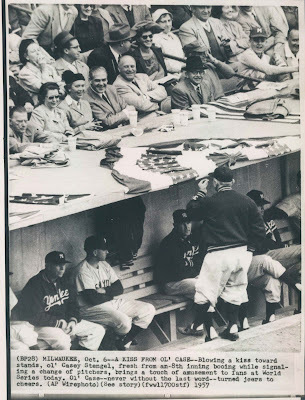 They are intrigued by the concept." Outfield ads as ballpark improvement? I'm sure advertisers were intrigued. We don't often think of that as a retro look, so it's interesting to see it literally being sold that way. And that was the Brewers' first tribute to their American Association namesake. 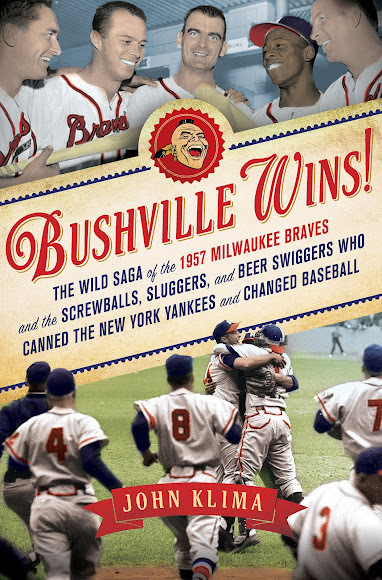 The second, three years later, would reflect a growing awareness of the city's rich baseball history.